Continuing my series on having fun playing any edition of D&D, I'm finally getting around to 2nd Edition AD&D. As a reminder, I'm going backwards, starting with 4th Edition. This one for 2nd Edition is going to be a bit of a cheat because I never actually played 2nd Edition D&D. Well, my family moved from Sandy, Utah, to Southern California in the Summer of 1986, which was about three years before 2nd Edition came out. So, I lost my gaming group and had to start from scratch. I finally did meet some guys who games, and we actually played a short-lived Warhammer Fantasy RPG game in the Summer of 1988, after my Senior Year of High School. The GM of that campaign is actually currently a player in my long-running World of Samoth campaign and also is running his own Pathfinder game campaign currently. After our Warhammer game fell apart, everyone kind of just drifted away from gaming. Everyone, that is, except me. I was still really into D&D, and still looked forward to my Dragon magazine showing up in the mail every month. During my Freshman year of college, I started to read in Dragon about how a new edition of AD&D was coming out soon, designed by the guy who pretty much wrote the 1st Edition Oriental Adventures book. And, I'm gonna say it - I loved that book. I know that's not a popular thing to say in the OSR Community, but whatever. I totally dug Oriental Adventures and was really looking forward to a new edition of D&D because I thought it would incorporate a lot of things from that book as well as stuff like Unearthed Arcana (another book that I really liked). As I've mentioned before, during my Freshman year at college over Winter Break, I had the chicken pox and spent pretty much the entire break working on a new campaign setting that eventually morphed into my World of Samoth. I spent a lot of time developing new sub-classes and tweaking the races and everything, all based on 1st Edition Rules. But, again, I had no group to play with. No gnomes or half-orcs. What the Hell? I hate gnomes personally, but why take them out of the Player's Handbook? Shouldn't it be up to the DM to decide if he wants them in his world or not, instead of up to TSR? I did like half-orcs and it really bothered me that they were no longer part of the core rules. No assassins or monks. By this time, I had been exposed to the original sources of the classes via the OD&D Blackmoor supplement, and I was annoyed that this "history" of the game had been excised from the core rulebook. No Unearthed Arcana classes or Oriental Adventures classes. This one really grinded my gears. What happened to all of this new material that had just come out over the past few years? Why were these classes missing? The ugly light-blue section headings and the font. Yeah, this might seem like a minor detail, but I was really of the mind that the texts should look old and difficult to read. Every RPG product I had read up until that point had a small point size for the text and minimal layout. They were atrocious to read (well, except for the Moldvay Basic book, which I started with, but had at this point in my life set aside as being too "childish"). The layout and fonts in the new book seemed to "mass market" to me - too polished. This is really hard to explain but it really bugged me. No more Gygaxian text. This was another huge problem for me. Gary tended to write in long, run-on sentences and used tons of words I'd never heard of before, and his writing really seems to have been stream-of-consciousness. There is no attempt, for example, in the 1st Edition Player's Handbook to organize the content of each character class in the same way. Yet now in the new 2nd Edition PHB, we were missing all of the fancy words and every class description had the exact same layout. Looking back on it, I think the layout part, especially, was a huge improvement. But, back then it bothered me because it seemed to much like they were making it look like the Moldvay Basic book and that meant more "kiddie" in my mind. I'll also say that by taking out all of the big words that Gary used, it basically created a corporate mentality that "People aren't smart enough to understand this stuff." It's a mentality that's creeped into a lot of media over the past few decades - a constant under-estimating of the intelligence of the audience. I'm not even going to comment on the DMG or the horrendous three-ring binder Monster book because I never purchased those. Years later, I did pick up the hardback version of the Monstrous Manual and I actually thought it was a decent book, but of course I never actually used it in play. There were two things that I did really love about 2nd AD&D. The first was the idea of character class kits. 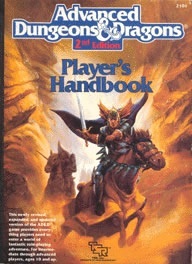 There were hundreds of these things, published over the entire length of 2nd Edition's lifetime, in books like the Complete Fighter's Handbook, the Complete Book of Dwarves, and even some odd ones like the Complete Ninja's Handbook and the Complete Barbarian's Handbook (each of the last two introduced new classes as well as new kits). I got almost all of these books, even though, again, I wasn't actually playing the game. But, I used them a ton to create new kits for my campaign world. It was so much easier than designing a new class or sub-class from scratch. If you're not familiar with kids, the idea was that you picked a character class, like a Fighter, and then you could pick a kit, such as Noble, Peasant Hero, or Wilderness Warrior. Each kit gave you ideas on personality and role-playing tips, as well as a little bonus and a little hindrance or penalty. Sound familiar? These started to become common at the tail end of D&D 3.5 as new rulebooks gave ideas for swapping out standard class abilities for others in order to create a new concept. Pathfinder uses this idea rather extensively in all of their rulebooks, and I think they're an awesome idea. I loved the idea of kits in 2nd Edition. They did get a lot of flack from people, however, because they were wildly uneven - no two kids were equal in power. Some designers also did things like not giving a particular kit a penalty. Most of them involved role-playing penalties but provided a mechanical in-game bonus, so abuse was common. This was really the start, in my mind, of people being obsessed with game balance and that every bonus had to come with an equal penalty. The second thing that I really loved about 2nd Edition was the proliferation of campaign worlds. Tons of really cool, unique settings first made their debut with this edition, including Dark Sun, Spelljammer, and Planescape. I loved reading about these settings in Dragon magazine and actually bought Dark Sun under the auspices that it was for a "school project" (more about this in a separate post). These new settings were so imaginative and went way beyond the standard Tolkiensian fantasy as presented in the settings of Greyhawk, Dragonlance, and Forgotten Realms. So, even though I didn't actually ever play 2nd Edition, I got tons of use out of the stuff that I owned (mainly all of the Complete Book of... series) because I used them as inspiration for beginning to more fully flesh out my campaign world. I've found that one of the easiest ways to explain a culture in a fantasy game is to say "their fighters fight like this" or "their priests act like this." In 1st Edition AD&D, I found this was somewhat harder to explain because all clerics were the same. A cleric of Odin, a cleric of Osiris, and a cleric of Ishtar, in 1st Edition AD&D, are all going to wield maces, wear plate mail, and turn undead. In 2nd Edition, I could use the Complete Priest's Handbook to distinguish these clerics and create unique religious organizations specific to my campaign world. I should also point out that, of course I'm a total hypocrite, because while I thought that AD&D 2nd Edition was too different from 1st Edition AD&D, I immediately fell in love with D&D 3rd Edition, and that game is of course light years different than 2nd Edition AD&D. Go figure. What were your experiences with 2nd Edition? What or didn't you like about it? I played 1st Ed for years and loved it. When 2nd ed was announced I do recall their being some dissent in the ranks. My DM at the time was not going to switch, but I did. It was the first edition of D&D I got as soon as it was released. It was also the first edition I ran far more than I ever played. My world of choice was Ravenloft and I loved it. I actually liked the three ring binders for monsters. I was heavy into making my own material back then so printing out a monster on my new dot matrix printer and adding it to the binder right next to the official monsters was fantastic. I got the hardcover version and all the splats. It was also the first edition of D&D to make me ever want to quit the game all together. The power creep in the "Complete" books was getting really bad. Those skills and powers books were the worse. Of course the writing in some of them were just plain awful. I also hated the fact that demons and devils were gone. But it caused such a stir that on the nascent internet you could find all sorts of things for your game. And TSR at the end was far worse than anyone seems to recall. WotC would have to work long and hard to equal some of the crap that TSR tried to pull there at the end. 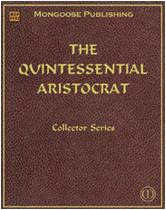 So 2nd ed is the most contentious edition for me. It is also the one I am least likely to go back and play despite the joy it gave me. I'd say they've pulled even. (For one, TSR NEVER trash talked their fanbase in the obnoxious manner WOTC did at the start of 4th Edition!) YMMV. I totally forgot about Ravenloft. I had the original I6 module but I had never collected any of the 2E era campaign world stuff. But, I remember reading about it a lot in Dragon. I never read the Skills and Powers stuff, but my understand is that it sort of creates yet another edition of D&D - sort of a "2.5" that bridges 2nd and 3rd Editions. Is that accurate? Oh come on, be fair; the SAGA system is pretty good, and if they hadn't hitched it to a reboot of the Dragonlance setting it might have been better appreciated. Skills and Powers and the other Player's Option stuff wasn't a new edition as such, but a set of tweaks that still had AD&D2 at the core. You could say that it's a bridge to D&D3 in that it's an implicit recognition that the then-current edition wasn't working as well as it should. I think you are about two years older than I am, but my experience was much the same. The proliferation of material to support 2nd edition was great on the one hand, because it was interesting to read and to find inspiration for a campaign. I especially liked the HR series that went into different ages (Viking, Greek, Roman). I just remembered. I was at GenCon before 2nd edition was released, and I sat in on a discussion with David Zeb Cook that you could sign up for during the Con. I was probably around 14 at the time. One of the things that stuck out in my mind during the discussion was this one "dissenter" who seemed very upset that Mr. Cook was doing away with the negative strength adjustment for human women. Even as a youngster, my thought was, it has got to be tough designing a game and having to put up with the fans. @Random Wizard - I totally forgot about the HR series, too, but I absolutely loved those. I had the "Charlemagne's Paladins" and "A Mighty Fortress" ones, and much later picked up the ones for Rome, Vikings, Celts, and the Crusades. Those were fantastic. I'm totally jealous about you attending that Con sitting in on that discussion. My young self would have loved that. I sort of living vicariously through social media with the new announcements about 5th Edition (or "D&D Next" or whatever we're supposed to call it). I like reading what people are tweeting or posting about what the designers say about the new edition. It reminds me of the old days when we got to read previews in Dragon magazine. I played AD&D2 exactly once, but I read the books often. I have a certain fondness for the funky layout and the weird blue ink -- was that done to prevent photocopying, I wonder? -- and I even quite liked the revised "2.5" versions of the books, although not as much as the strange, arcane look of the originals. I'm also very fond of the Monstrous Manual from that edition, and it's one of my favourite monster books. It's a shame that I didn't get to play it more often, as I liked the look of the settings but could only appreciate them from afar. Aside from a couple of sessions of the "black box" D&D I didn't get to play any version of the game until D&D4 came out. That's so interesting you comment about the blue ink to prevent copying - I never thought of that, but I fondly remember using my "non-repro blue" pencil to do layouts in graphic arts classes in high school. Totally agreed about the Monstrous Manual - it has always been one of my favorite monster books. The 'sins' of 2nd Edition Era(and there are many) are forgiven in my eyes for the Ravenloft and Dark Sun lines, the excellent DM's Guides and Historical Series, and the resurrection of Greyhawk as a game setting. I love that blue ink, too! Yeah, I think the settings were, for me, what "saved" 2nd Edition (again, even though I didn't ever play the system). But I also seem to be in the minority on the whole "Complete" series of books. I liked a lot of those, but since I never actually got to use them in play, maybe it's possible that there were a lot of problems with them, mechanically-speaking. I had an unsettled time in the 1990s so it was a dry decade as far as gaming was concerned. I played 2nd edition only once, and I ran it four or five times. I wrote a lot of adventure/campaign material using it, though. I like: the blue ink (! ), the emphasis on the four core class types, the removal of monks (always hated 'em) and all the Unearthed Arcana tosh, specialist priests and wizards, kits for fighters and thieves (I don't think spellcasters need 'em), THAC0, and especially the Historical Reference books for Vikings, Celts, Rome, etc., which are full of creative tweaks. I dislike: the bland prose, the bland and tacky full-colour art, the renaming of demons and devils (though that's easily undone), XP for "story" rather than treasure. Oh, all those adventures I wrote? I'm converting them to B/X. "I dislike: the bland prose..."
Totally agreed. Despite how "difficult" some of Gygax's first edition writing can be to get through, especially for younger people, it's so much more descriptive and thought-provoking. In 2E, I feel that they watered it down too much and took away a lot of what made it mysterious and fantastical. I played a little 2nd ed. It was ok, but really not enough of a improvement over 1st to get my gamer friends to switch. It was easier to understand, but it was no where near as liberating as 3rd. All of a sudden Thac0 was gone and all the numbers made sense. The 'too many options' complaint you mentioned in the 3rd E blog seems silly when you are dealing with an open ended game of play, right? Yeah - looking at the ruleset, I feel like, if I were to have played 2nd Edition, I probably would've just mixed it with 1st Edition. Nobody would've really been the wiser. It's similar to the way we play Pathfinder/3.5 these days. We mix and match and almost never update stuff unless someone else already did the work for us. The "too many options" complaint was one that I saw a lot of during 3rd Edition - people complaining over and over about the amount of material that WotC was producing. My feeling on the subject is - just don't buy it. It doesn't hurt you if they put something out that you don't want or think is stupid. Just skip it. They're in the business to make money so they're going to come out with supplemental products. Sheesh. Minor correction--- Gnomes were never removed from the core rules of 2E. They are right there with the other races (but not the Half-Orc, as you have noted) in the Player's Handbook. Right you are! I went back and checked my book because I could've sworn that gnomes were not part of 2nd Edition. Thanks for the correction, and also thanks for reading my blog. Cheers! I love 2e D&D. Mechanically, it is a polished version of first edition that incorporates a lot of the AD&D 1.5 rules as "Optional" rules. There ARE changes, but a lot of those are for the sake of balance or clarification. But overall, it is VERY similar to 1e, and you can mix and match them quite easily. There WERE controversial changes like removing the demons, devils, and assassins. But you have to understand that there was a satanic panic in the 80s that was putting a great deal of pressure on the company. Given that D&D was shifting from older to younger players, they dropped these elements to minimize the blowback from anti-D&D groups. Of course, anybody who wanted to add those things back in was free to do so. And devils and demons DID return, with different names that wouldn't trigger the haters. So really, there was NOTHING preventing you from running your 2e game in a 1e style. And in fact, this is how I DM. I like the streamlined ruleset and clarity of 2e, and I feel that it's better balanced overall. But I still have demons, devils, assassins, and Harlot Encounter Tables. My campaign is VERY adult thematically. 2e DID drop the ball in several areas. The writing was uneven in general, and lacked the mystique of Gygax's unique voice. Yes, Gygax was perhaps a bit too much at times, and the 1e books WERE horribly arranged, but the feel of the prose was glorious, and has never been matched. I think 2e also dropped the ball artistically. 1e had artists like Dave Trampier, Erol Otus, and Russ Nicholson that had extraordinarily strange and evocative drawings. Jim Holloway, who came later, was also decent, if a bit more pedestrian. There were also some really nice pieces by Jeff Easley and Larry Elmore. Yes, 1e had some amateurish art too, but even that usually has a bit of humor or an interesting situation being depicted. 2e got off to a good start with art in the Monstrous Compendium. Jim Holloway's artwork in that book is actually quite good and very underrated in my opinion. Admittedly, the loose leaf format was a terrible idea in hindsight, but the art was pretty good. I always wished they'd have re-released a bound version of the MC. Unfortunately, Jim Holloway only did the first few books and Tom Baxa was called in to do the rest. Tom Baxa's artwork is some of the worst in D&D history and it is EVERYWHERE in 2e. I think he did all of the monster books after Holloway stopped, and he did countless splatbook illustrations. So going back and reading those books is really unpleasant because you KNOW the art is going to be full of his loathesome scribblings. They also had a guy that did chalk drawnings on black or grey paper that I never cared for. Overall, the 2e art was generally bad or mediocre and felt cheap and rushed, like they were cutting corners (and knowing how badly TSR was run, that's probably true!). And that's a damned shame. Because a good piece of artwork can fire off the imagination in ways that a bad piece of art never will. But if you set that aside, and look at the stripped down 2e engine beneath the hood, it's quite good. It's well-organized and efficient and its easy for players and DMs alike to find what they need. And because it's backward-compatible, you can run this in a fully "Old-School" style if you want. Sure, 2e books often lack flavor, but it's added back in easily. Personally, I use the 2e rules and the 1e flavor in my campaign and I'm delighted with the results. Thanks for commmenting, and sorry for the delay in responding! I definitely remember all of the hubbub about the demons and devils, and remember exactly why they were deleted from 2nd Edition, along with half-orcs and assassins. I'm pretty much in agreement with everything you wrote, and very much agree with your statements that the writing "lacked mystique" (something I mentioned in my post) and that the art was a little too corporate-generic for my tastes. I sadly never got a chance to play 2nd Edition. It came out right after I'd moved, and I hadn't found a new group to play with. The group I finally did find chose Warhammer Fantasy Roleplay as their RPG of choice, so I used my collection of 2nd Edition supplements (the "Complete..." guides mainly) to flesh out my campaign world that I eventually transitioned to 3rd Edition.